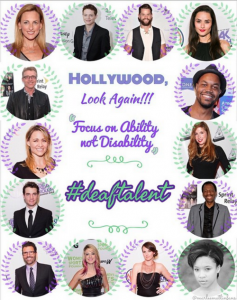 Over the past couple weeks, the #DeafTalent movement spread like wildfire across social media. Using this hashtag, members of the Deaf community publicly spoke out against the cultural appropriation of deafness in movies and TV. 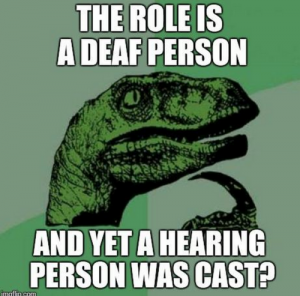 With so many talented deaf/HoH performer working to catch their big break in Hollywood, it is inexcusable that hearing actors and actresses continue being cast for these roles. Deaf parts belong to deaf performers– people who understand the experience of hearing loss and can accurately portray deaf characters. Just as blackface is not an acceptable way to depict a black character, having a non-deaf actor pretend to be deaf is irresponsible, unethical, and offensive. The #DeafTalent hashtag began making waves after a NY Daily News interview with Catalina Sandino Moreno raised red flags in the Deaf community. Moreno, a hearing actress, was cast to play a deaf woman in the leading role of her new film Medeas. But in the NYDN interview, it became clear that Moreno has had very little exposure to deafness or Deaf culture. After watching the trailer for the film and then learning that a deaf actress had even advised Moreno not to play the character, many deaf actors used the internet to express their frustration. Academy Award winning deaf actress Marlee Matlin weighed in on the Medeas controversy in a series of tweets which pointed out the cultural insensitivity of the filmmakers. She particularly addressed their use of the term “deaf mute,” which many in the deaf community regard as outdated and oppressive. The community rallied to let it be known that hearing actors taking on deaf roles is simply not appropriate. As talented deaf individuals struggle to find work in Hollywood, due to a lack of roles, it is problematic that the few available deaf parts are being given to non-deaf performers. Deaf artists and allies began using #DeafTalent to point out the cultural disconnect in our mainstream media, to highlight those who have succeeded against the odds, the and to help promote the many talented deaf people who are seeking work in the film and TV industry. 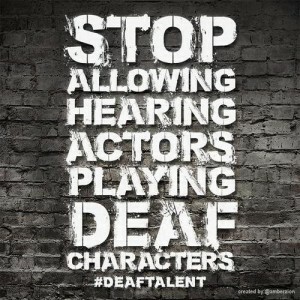 Actress Amber Zion created a grapic demanding Hollywood to “Stop allowing hearing actors playing deaf characters.” This meme was widely reposted across social media, raising awareness about the #DeafTalent campaign. Filmmaker Jules Dameron, who recently released a Disney-approved ASL version of “Let it Go” from Frozen, used her Tumblr page to track the #DeafTalent movement as it grew. This two-part post amplifies the voice of the Deaf community by providing a comprehensive #DeafTalent timeline with videos and links. The issues surrounding the #DeafTalent campaign have been simmering for decades, and they deserve mainstream attention. Many members of the Deaf community have done a great job dissecting the problems that exist in Hollywood, and proposing ethical solutions. There are some very intelligent and talented deaf individuals attempt to educate the media about portrayals of deaf/HoH in film and TV. Thomsen Young wrote an excellent piece on The Silent Grapevine that explains why #DeafTalent matters. Young concludes that this movement goes beyond Hollywood, it is a demand for opportunities in all areas of life. 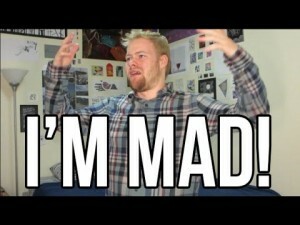 Deaf YouTuber Rogan Shannon posted an impassioned video titled I’M MAD where he elaborates on why non-deaf actors in hearing roles is a cultural problem. Another deaf YouTuber, Rikki Poytner tells Hollywood she “has a bone to pick” with them in her video. Poytner’s straightforward take on the #DeafTalent campaign is both entertaining and educational! Meanwhile, proving the value of #DeafTalent, deaf actress Treshelle Edmond performed a beautiful ASL rendition of the National Anthem at the Super Bowl. 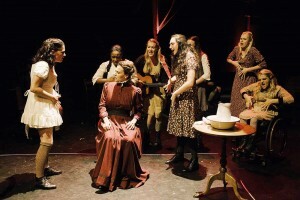 The Deaf West production of Tony Award winning musical “Spring Awakening” wowed audiences, selling out and receiving critical acclaim from both deaf and hearing audiences. If Hollywood can’t find capable #DeafTalent, it’s because they aren’t really looking for it. While deaf performers compete with hearing actors to fill deaf roles, it’s becoming clear that general audiences crave true diversity. But when will the film and TV industry wake up? As I watch my deaf nieces become beautiful talented young women, I know we must fight for all children to grow up in a world of possibility. The #DeafTalent campaign is about more than just deaf actors in Hollywood, it is about creating opportunities in work and in life. It is about empowerment and deaf self-advocacy. It is about breaking down the cultural attitudes that serve as barriers, keeping skilled and capable deaf individuals from pursuing their dreams. #DeafTalent is about providing opportunities for deaf people, and preserving their right to be successful.